I find buying books hard to resist. My wife, no slouch herself when it comes to reading, thinks I suffer from an addiction or compulsion – a kind of book lust. I find it impossible to content myself with simply buying another book to read when I have finished the last one. As I’ve written before I often have several to-read piles of ridiculous ambition on the go, which lurk in various places around the house. For this reason a visit to Ely is a dangerous thing. The city, one of Britain’s smallest, is only there because of the cathedral. At some point in the late 7th century Ethelreda founded a monastery on the site of a parish church and by around 300 years later, it had become one of the two richest abbeys in all England – second only to Glastonbury in its vast wealth. In the Norman period work on what became the present cathedral began and for a few hundred years the good times continued, as countless pilgrims made their way towards this place on the River Ouse to visit the shrine of the now St Ethelreda, until 1539 when Henry VIII put an end to that kind of thing. All the while around the magnificent gothic bulk of the ‘ship of the fens’ people began to settle and the little city grew up around it. That, along with Cromwell’s house, is what draws most outsiders to Ely. 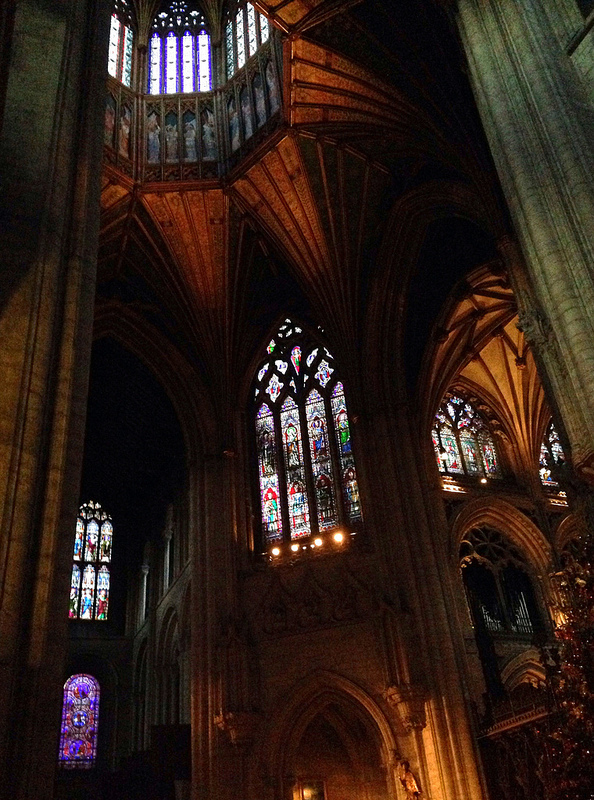 Like many visitors, I too have gawped up at The Cathedral’s Octagon and admired its breath-taking beauty. 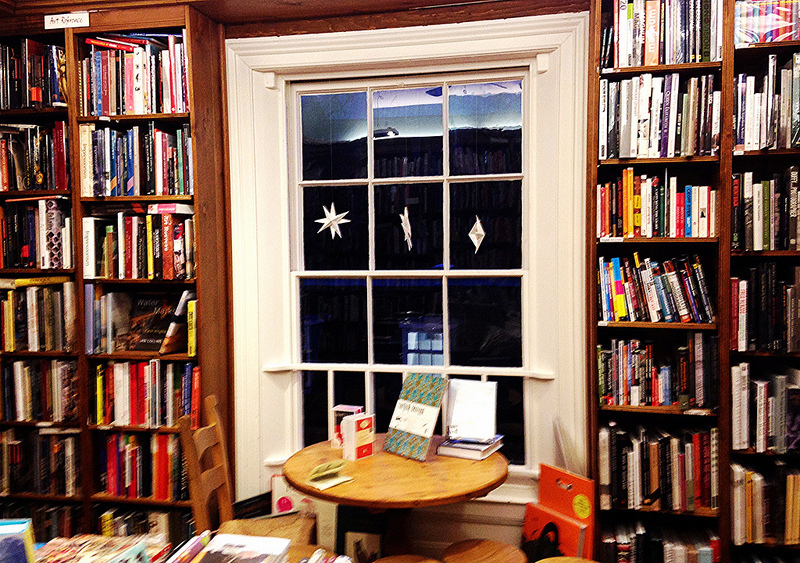 However what I really like about the place is the magnificent bookshop on the High Street (whose windows look out over the Cathedral just in case you find yourself missing it). The Topping and Company bookshop is so good it’s almost laughable. This is the kind of shop that you don’t expect to find in real life; only, perhaps, in a lost Penelope Lively children’s book, or there to be sneered at for its too-good-to-be-true perfection in a Richard Curtis film. But such a shop does exist and just after Christmas I paid it another visit. The crime section alone, by the door as you walk in, is bursting with volumes and not just the usual suspects. I don’t read a lot of crime stuff, but I am partial to a bit of Walter Mosley and Phil Rickman. In my experience, in the average bookshop you’re lucky to find one book from Rickman’s Merrily Watkin’s series – a kind of police procedural meets the paranormal with a female vicar – the Deliverance Consultant or Advisor on the Paranormal, for the Diocese of Hereford at its centre – but that’s the bare bones and doesn’t do the series justice (in addition to the well-handled crime and paranormal elements, Rickman achieves a brilliant sense of place in the books, has constructed a great, believable, non-sentimental relationship between mother and teenage daughter, creates fully-fleshed out characters – even the police and packs each book with interesting folklore, history, music and literary references). Topping & Co had every single one in the series, along with most of Mosley’s brilliant Easy Rawlins novels, so I take that to be a good sign. Throughout the rest of the shop dark shelves reach up to the ceiling along every wall, and on all three floors. Tables groan with stock. Everywhere there are books, books of all kinds, on most subjects you care to name, here are books you’ve seen reviewed recently, there are classics you always meant to get around to reading, Folio editions, large format illustrated hardback treasures, a wonderful children’s book section, small press local history books, books you didn’t know existed, but are delighted to see that they do. The retro-hit du jour, concerns the quiet life of an academic at the University of Missouri in the early 20th century. I’ve actually started this and the hype is not wrong. A beautiful, wise and compassionate book so far. This is how you lose her, Junot Diaz. Faber. New collection of short stories by the author of Drown and The Brief Wondrous Life of Oscar Wao. The Ghost Hunters, Neil Spring. Quercus. An account of Harry Price’s investigations at Borley Rectory as told by his fictional assistant. Two volumes from a fascinating series by Reaktion books covering the cultural, spiritual and historic stories of an extensive range of animals. The Trip to Echo Spring: Why writers Drink, Olivia Laing. Picador. Author of To The River on the relationship between alcohol and some of the most celebrated American writers of the last century. This Other London, John Rogers. Harper Collins. Another one I’ve already started. Intriguing exploration of London’s sprawl as the writer and film-maker investigates the city’s less celebrated streets and neighbourhoods. Marshland, Gareth E. Rees. Influx Press. Exploring the eldritch world of the marshes of Hackney, Leyton and Walthamstow. Yeah, Yeah, Yeah: The Story of Modern Pop, Bob Stanley. Faber. The man from St Etienne delves into music and tries to avoid indulging in muso-rock snobbery. Meant to re-read last year for its 20th anniversary. Hope its as brilliant as I remember. Seven-Tenths: The Sea and its thresholds, James Hamilton Patterson. A wonderful, wonderful book on all aspects of the ocean from charts and islands, to pirates, fishing and loss, monsters of the deep, wrecks and death. This should be much better known. A dark-tinged celebration and meditation on London’s multi-layered history, sees historians, Neanderthals, figures from Arthurian myth and West Indian immigrants, amongst others explore, discover and add their stories to the ever hungry city. That should keep me going for a while. 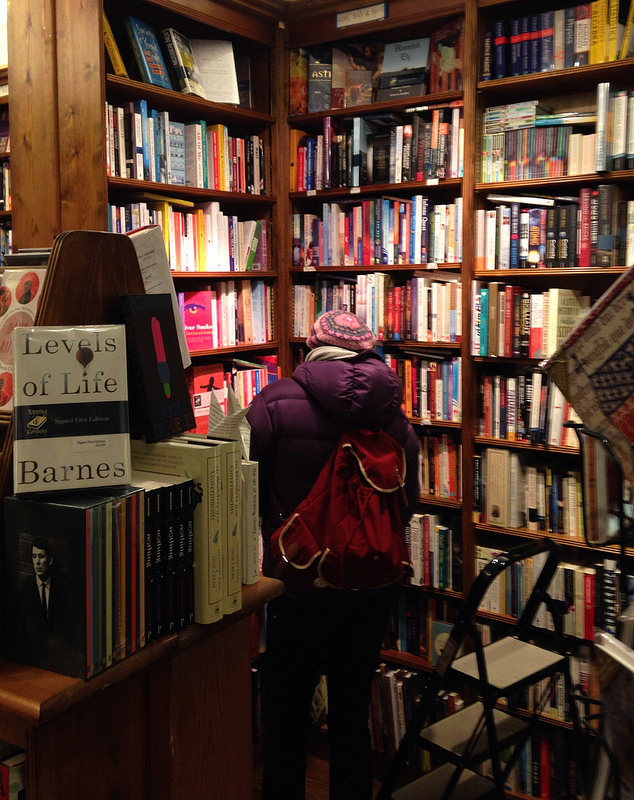 Whatever takes your fancy in books, if you find yourself in Ely, visit the bookshop. It might even be worth making the trip to do just that. The bath branch of Topping organise a signing with Neal Gaman last year… Which was nice. Their events seem to be very popular with authors. 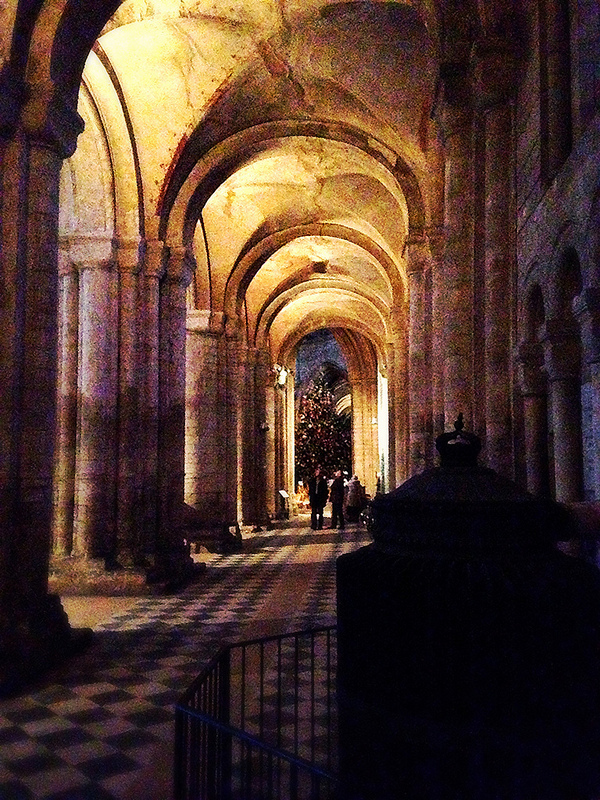 At Ely for the bigger names they have readings in the Cathedral, which must feel quite grand. Would be brilliant if the other branch organised talks from the bath. 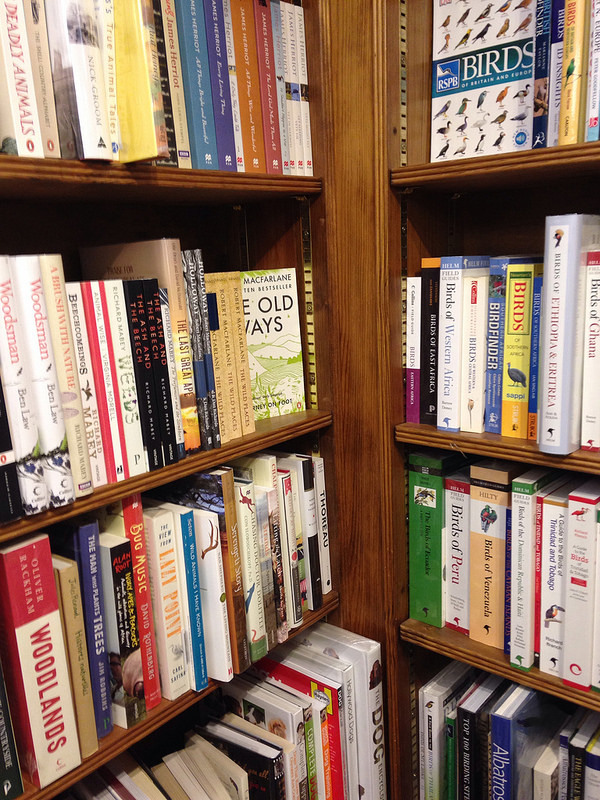 Another book/bookshop addict here – always encouraging to know one is not alone! Actually did quite well in reading last year but even so didn’t make much inroad into the piles. I find things in charity shops all the time so even more tempting as they are (relatively) inexpensive. Housman’s is great and they have brilliant events too – cost of ticket is refunded if you buy the relevant book/books. So many bookshops have disappeared in London too unfortunately. However there are some newer ones such as Pages of Hackney, where some of my Christmas presents came from (The New English Landscape for one). The Maureen Duffy sounds interesting. I love those Reaktion animal/bird books. Glad to see there are still quite a few of us book and bookshop addicts out there. This post seems to have struck a chord. Eddie Procter mentioned Housman’s as well – must check that one out along with Pages from Hackney. I’m lucky to have two decent independents near home – Bookseller Crow and Dulwich Books but those kind of shops are becoming increasingly rare, especially in North London, I found it a bit of a shock that Crouch End of all places couldn’t sustain a bookshop when Prospero’s went to be replaced by an ice cream bar! And I remember a time when Upper Street had three bookshops and now there are none. Hopefully those with serious book habits can keep some of the survivors going. Prospero’s was a great loss. There did used to be a secondhand bookshop in Crouch End too, now a pizza takeaway I think. Those Upper St bookshops were wonderful – I spent so much money there perhaps it is just as well they have gone! Coincidentally I walked into my local library today and saw a Phil Rickman book with the new books – December, so I got it out. I’d never heard of him. I’ll let you know what I think! How funny. That’s one of Rickman’s stand alone novels, still with supernatural elements I think. I suppose the bookshop in muswell hill is clinging on. As is the wonderful Stroud Green library. Oh this article chimed in so many ways. Endless reading lists, books under my bed ready to read, almost wishing my friends didn’t pass on any more recommendations. Oh and sometimes buying a book only to discover a few days I’ve already got it, forgotten it and still not read it. Hi Alex glad it’s not just me. I got into trouble before Christmas buying a couple of things that sounded interesting only to be told off for not waiting. The worrying thing about the reading lists if you’re anything like me is that thing about having multiple lists – a list might be do-able but I seem to have lengthy to-read lists for several different subjects. I’ve been to Ely once but didn’t come across the bookshop – sounds a good one. I have a similar addiction. Favourite bookshops of mine are Mr B’s in Bath, Housman’s in King’s Cross, Saltaire Mill near Bradford, Broadleaf Books in Abergavenny and, of course, the whole of Hay-on-Wye. Pitty that Bristol has been denuded of decent bookshops in recent years, other than some good charity ones. Thanks for retweeting the post. Glad to hear that there are still a few other decent bookshops around. I’ll have to investigate – starting with the King’s Cross one. The people behind the Ely shop have another branch in Bath, though I haven’t been to that one. It’s really sad about Bristol bookshops – George’s where what’s left of Blackwell’s now stands on Park Street used to be a brilliant shop. There was also Chapter and Verse across the road and Forever People had what seemed a vast collection of Fantasy and Sci-Fi in their old shop lower Down Park Street. Cotham Hill books and Bristol Books were both pretty good too. Obviously my Mum’s The Wise Owl formerly of Upper Maudlin Street was my favourite. The Amnesty one on Gloucester Road is usually worth a look from what I remember, though a bit pricey. 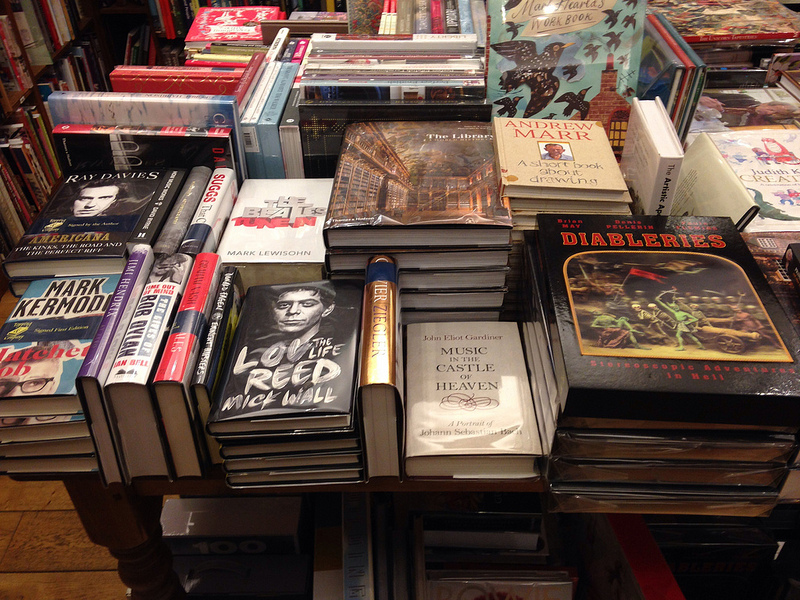 Elsewhere I chanced across a good one – in the sprawling and higgledy-piggledy sense – in Carlisle – Book Case I think. Another in Sheffield called Rare & Racy which also sells records. Quite like Skoob under the Brunswick Centre in London, but they can be a surly bunch. You’re right about Hay it’s great – we once went two years running to the festival and probably spent more time in the bookshops or on local walks than in the main site itself. The latest Phil Rickman who I mentioned in the post is set in Hay on Wye and centres on a bookshop. Not one of the best in the series though. Following on from previous reply – noticed a couple of interesting looking shops in Hastings too, but didn’t have time to investigate.